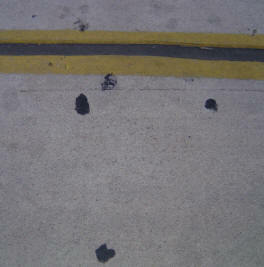 Gubs are those round, black spots you see on the pavement and sidewalks outside most public establishments, especially gas stations and restaurants. You may have seen thousands of them but never realized what they are or even noticed them. Once you do, your world will never be as clean; some establishments have thousands of gubs on the ground in the immediate vicinity of the door. 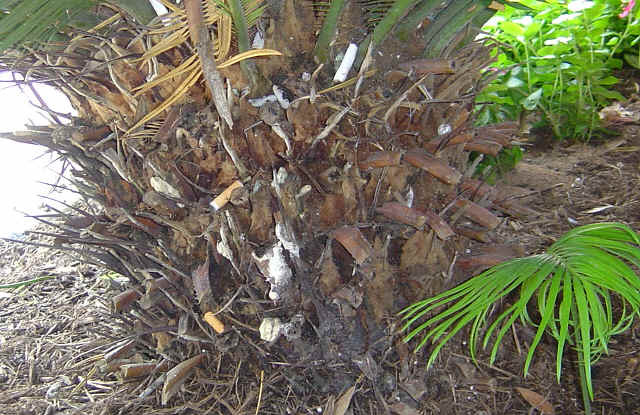 Gubs are discarded wads of gum that have become flattened and blackened by car tires, shoes, and blowing dirt. Almost every building has hundreds of them around the entrances and even private, low traffic businesses will have a few. Of course, virtually every table on earth has several of the familiar "inverted" gub stuck to the underside but the outdoor gub, although more numerous, often goes unnoticed. Gub Science is the study of the creation, evolution, distribution, and life cycle of the gub in the wild. Although every stretch of pavement or concrete has gubs and the total number of gubs must be in the high millions, it is surprisingly difficult to catch one being created. For one thing, the gub creator doesn't want to be seen and the gum is often dropped to the ground in a surreptitious manner. And the gub starts out as a fairly small spherical entity that doesn't reach its ultimate large diameter until it has been repeatedly trod upon by shoe or tire. New gubs are usually white or pink but green has been seen, too. A fresh gub is round and quite sticky, a characteristic that leads to other gub phenomenon. "Gub Shadows" are created when a new gub is stepped on and part of the gub sticks to the shoe. The following steps sometimes redeposit small gublets that are considerably smaller than the parent gub. These shadows can indicate the direction of travel of the human carrier. "Scraper Gubs" may also be found in the vicinity, especially on curbs or other discontinuities in the pavement where the shoe wearer has endeavored to remove the gum from the shoe. Scraper gubs tend to appear as streaks instead of disks. Once a gub has been exposed to the environment for a few days, it loses its stickiness and simply grows in diameter when flattened by a shoe or tire. Gubs that are not sufficiently flattened early in their life tend to crack around the edges and pieces break off leaving a jagged gub or j-gub. It should be pointed out that the gum/gub link is only a theory and other gub origins are possible; comprehensive studies of gub fields have not been done. However, many gubs have been clearly seen to have a gum origin and, until otherwise demonstrated, Occam's Razor suggests the gum origin is a correct and sufficient explanation for the vast majority of gubs. At a typical location gubs are usually concentrated a few feet from a door or stopping place, dropping off in an exponential fashion at greater distances. The pattern is suggestive of a Boltsman distribution and one is tempted to consider the concept of a gub temperature. This is a spatial distribution so this "temperature" would relate to the pressure on the gub creator to deposit the gub and would not relate to the quantity of gubs. For example, a fancy restaurant might have a high gub temperature with a peak in the distribution far from the door because people feel early pressure to discard their gum. A video arcade might be expected to have a low gub temperature and might have a gub peak only one or two meters from the door with a significant portion of the curve inside the door, unless management is diligent in cleaning the interior floor. Gub concentrations are also found near waste receptacles, flower pots, and other likely targets. Gubs per square meter vary greatly depending on the nature of the nearby establishments and the quantity of human traffic. It isn't clear what information might be teased from a comprehensive study of gub distribution as is often the case with basic science. The gub's life cycle has not been studied in any great detail and most knowledge is inferred. Clearly, gubs start out light in color, round, soft, and sticky and over time they become flat, hard and dark or black. How quickly this process occurs is largely unknown. 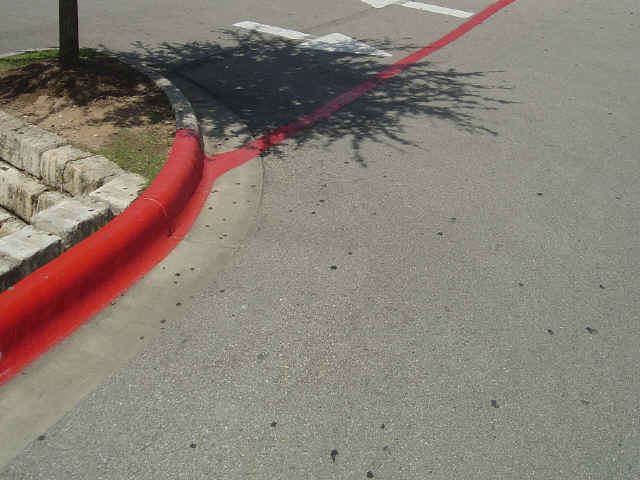 Very old gubs on asphalt blend in and look like nothing more than surface variations in the asphalt whereas gubs on concrete usually stay darker and are easily seen for many years, wearing away quite slowly. Different gub formulations no doubt have different life cycles but no data is available. Gub evolution is primarily effected by changes in the formulation of gums. New gums have new ingredients that change the stiffness and longevity of the resulting gub. For example, certain new gums purport to have minerals to strengthen teeth and these minerals might have a significant impact on the gub (although these minerals are concentrated in the gum's coating which is virtually gone by the time the gub is born). Changes in soles and tire treads may also contribute to gub evolution as might asphalt and concrete formulations and surface treatments. Social behavior is another potential input to gub evolution but is more likely to be manifest as changes in gub distribution.